Since coming back from the 2008 Book Expo America in Los Angeles, I have been wanting to write my review on Amazon’s Kindle. My relationship with Amazon is multi-faceted. Like most book lover, my first relationship with Amazon is as a customer. In my opinion, Amazon has the best website to research and search for books. It also has the best book community support. Secondarily, I am an Amazon reseller. I resell my books and titles through their Amazon Advantage and Amazon Marketplace programs. Overall, it is a good business relationship. Essentially, I have grown to like and appreciate Amazon over the years. With the launch of Amazon Kindle, I find myself as both a publisher and a book reader evaluating the merits of Kindle. 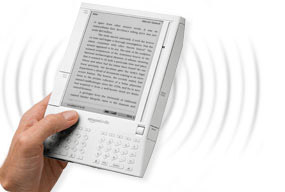 At nearly $400, I am resistant to buying an electronic device to read books. Although, I love my computer and everything it does, I still like to read old-fashioned books. I just like the convenience of flipping through pages and basically jumping around at a moment’s notice. I am still resistant to the idea of being depending on any electronic device to read. What happens if the device is damaged or lost? What I don’t like about books, however, is that they are subject to wear and tear. They are bulky and take up a lot of shelf space when you have hundreds of books like I do. They are a terror to move when packed into boxes. It is an annual ritual to purge books and either sell them or give them away. And it is difficult to find specific content within a book even with an index. As a publisher, I would like to do away with the printing of books and sell more content electronically. There is no hard printing costs, no warehousing costs, and it saves lots of trees environmentally. Having said all that, you will have a sense of my inherent biases and internal battle with Kindle. At BEA, I was quite happy to see Amazon with their large Kindle booth. Amazon intelligently and insightfully understood that there is still a huge portion of book readers who have never physically seen and fiddled with the Kindle. Unless you are on the cutting edge and don’t mind blowing $400 on an untried device, most people including me did not want to spend that money without actually having some hands-on experience with it. The folks at the Amazon Kindle booth seemed friendly. They were ready to engage anyone interested in playing with a Kindle. I awkwardly too the device and admired its design. It was light and clean looking. It had a relatively simple and elegant look. The quality of the reading screen even when viewed at a steep away angle was quite good. For the most part, Kindle was easy to navigate. I goofed a few times but I attributed that to my user unfamiliarity. The browsing of Kindle-titles was easy. The Amazon employee pointed out that there were still many titles not available on Kindle but work was aggressively being done to get more titles. As a publisher, I agreed with that. Amazon has been heavily courting publishers to release their content on the Kindle format. For me, I am interested but I have taken a wait-and-see attitude. I will get into why in another post. Back to the actual Kindle device, what I did not like about Kindle were the placement of the long page-turning buttons on both the left and right side of the device. I am guessing the idea of having a long elongated button is to accommodate different ways and styles that readers would hold Kindle. Unfortunately, I found it difficult to hold and adjust the Kindle with accidentally pressing one of the side buttons. There simply was no easy way to hold the Kindle in my left or right hand. If I wanted to adjust my seating position or get up, I found myself accidentally hitting the side buttons. The Amazon employee said that once you get used to it, that would no longer happen. That may be true but I feel the side buttons are too exposed. The designers gave too much space. My view of Kindle, like other electronic hardware or software, that this is a version 1.0. I asked about future revisions and that subject seemed to make the person helping me uncomfortable. I am guessing her job was to focus on selling the Kindle in the here and now, not focusing on a possible Kindle 2.0. I speculate that there will inevitably be a Kindle 2.0. There will be design enhancements and improvements to the hardware based on the feedback Amazon is receiving. Perhaps this review will be one they will refer to. They are likely to improve the battery life and viewing options such as including color. However, I believe color will come in Kindle 3.0. I think it is too much of a jump from Kindle 1.0 to Kindle 2.0. I don’t think Amazon is quite ready to so quickly obsolete Kindle 1.0. Overall, I enjoyed my user experience with Kindle. I understand why there seems to be a growing bubble of support for it. It really is a good device. But the downsides is still a deterrent for me. Kindle has to come down in price more. Even at 50% off, it would be $200. I am not sure I would still buy it at that price point. There has to be more titles. And the annoying side buttons need to be resized, relocation, or redesigned. It is ironic that I do want Kindle to be successful. And yet, for me as an individual reader, I still greatly prefer my books.